Try these simple grilled fish recipes for grouper, tuna, catfish, halibut, trout, and swordfish. We guarantee sizzling-good meals. The key to preparing this whole fish is scoring deep cuts for quick and even cooking. A side of salmon, hot off the grill and laid on fig leaves from a backyard tree if you have one, makes a spectacular main course. If you're daunted by the prospect of flipping such a large piece of fish, cut it into three sections before grilling (they're easier to turn) and arrange them end to end on the platter. Erin Scott, creator of the blog (and cookbook) Yummy Supper, gave us this recipe. Ask your fishmonger to scale and gut the fish. Light the grill for this sweet Brown Sugar-Grilled Salmon. Pair it with this summer's best Zucchini and Fennel "Noodles" for a quick, 25-minute dinner that is sure to hit the spot. 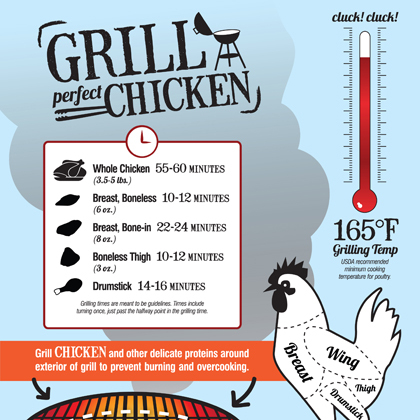 Grilling adds smoky flavor fast. Follow our Expert Advice to flip fillets effortlessly. Spice-crusted salmon teams up with the smoky crunch of grilled cucumbers. (If you think cukes are best saved for gazpacho and tea sandwiches, you're in for a delicious surprise.) A creamy yogurt raita, spiked with fresh dill and tangy bits of pickled okra, cools it all down. Carefully turn fish on the grill using an oiled metal spatula. Transfer to a platter, and serve with tangerine wedges. This is a nod to the nostalgia of our childhood TV dinner. But the difference here is fresh fish and our special tartar sauce, easily created from ingredients you likely have in the fridge. Throw some shrimp and your favorite veggies on the grill and have an easy and delicious summer meal in minutes. Throw some shrimp on the grill and try a Mexican staple with a delicious twist. This recipe is for those who love their tuna on the very rare side--feel free to cook the fish a bit longer, according to your taste. If you prefer, you can quickly sear the tuna in a skillet over medium-high heat instead of grilling. This salsa can be served with any grilled seafood, poultry, or meat. For this Baja-inspired recipe, it's especially important to regulate heat, erring on the gentler side, as the mahimahi needs sufficient time to firm up without charring too deeply. Salmon skin is easier to remove after cooking, so grill (or broil) the fillets first. Try this twist: Top with crumbled queso fresco (fresh Mexican cheese) for a tasty variation. Users rave over the homemade dressing in this easy Caesar salad with grilled shrimp. This healthy, satisfying dinner can be on your table in just 25 minutes tonight. Although imported swordfish is endangered, the population for North American species is healthy. Check with your fish seller to make sure the fish you purchase was caught in the United States or Canada. These delicious grilled fish tacos feature a homemade tomato-green onion relish that provides fresh, spicy flavor. Make low-fat fish tacos by grilling the fish instead of frying it, and topping the tacos with a light tartar sauce. This relish also works well with grilled chicken. Serve with a simple spinach salad. Be sure to purchase wild Alaskan halibut for a sustainable choice; avoid Atlantic halibut. Those who love the bold Mediterranean flavors of puttanesca sauce and grilled fish will love this hearty open-faced sandwich. Perfect for a stylish outdoor lunch, this dish features grilled bread topped with peppery arugula, halibut, and a garlicky tomato salsa strewn with bits of olive and caper. Adventurous eaters will lap up the creamy sauce spiked with wasabi, a fiery, pale-green Japanese horseradish. When spooned on top of a sesame- and pepper-rubbed tuna steak, it really highlights the dish's Asian flavors. With a meaty texture and full-flavored taste, swordfish stands up to the assertive spices in this Jamaican-inspired recipe. The steaks are coated in a tenderizing marinade of yogurt, lemon juice, and common spices like garlic powder, ground cumin, and ground cinnamon, but it's the spoonful of jerk seasoning that gives this dish that special kick. Get raves at your next backyard barbecue with these colorful and healthy swordfish kabobs. The secret is in the 12-ingredient marinade, a fabulous brew made from staples such as soy sauce, honey, rosemary, and citrus zest. Justifiably popular for its tender flesh and sweet, delicate flavor, snapper is commonly caught in tropical and semitropical waters, such as those near the Caribbean. Here, it is cloaked in a traditional French West Indian sauce featuring lime juice, garlic, thyme, and incendiary Scotch bonnet chiles. Chef Adolfo Garcia’s love of fresh seafood and his Panamanian ancestry are reflected in this marinated fish recipe. The marinade of bell peppers, olives, onions, and tomato juice also serves as a sauce for the mahi-mahi. Marinate halibut or mahimahi fillets in a mixture of vinegar, olive oil, cumin, and cilantro, then grill and serve on a bed of spicy slaw. Top grilled striped bass with a savory fennel relish and serve over a bed of wilted spinach for a sophisticated main dish. The robustly flavored sauce gets its inspiration from olives, tomatoes, and fresh thyme, but is simple to prepare. When the topping is this bold, go with a simple grilled technique for the fish. Spice-crusted, pan-fried catfish is delicious atop a pile of sweet corn and bacon hash. Use summer's best produce to make a simple salad for serving alongside the fish. The crust on this salmon is similar to duqqa, a mix of spices, chopped nuts, and sometimes chickpeas used in Egyptian cooking. Prep and Cook Time: 45 minutes. Many cooks only grill thick fish steaks because thin fillets break and fall into the fire. But a banana leaf solves the problem elegantly. It’s naturally nonstick, covers the rack, and lends subtle grassy sweetness to thinner fillets like flounder, snapper, tilapia, and sole, along with smoky grilled flavor. Two classic dips, tapenade and salsa, join forces for a fish topper that is salty, scoopable, and summer-fresh. The trout has a nice smoky flavor that is cut by the freshness and acidity of the chimichurri. 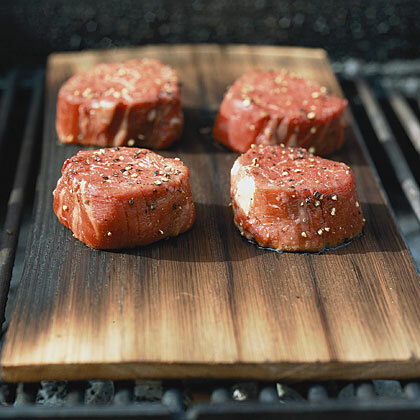 For a less smoky flavor, seek out thinner fillets (which will take less time to cook). Here we combine two of the our favorite early-summer ingredients—cherry tomatoes and fresh basil—into a fresh take salsa. For the crispiest skin (that doesn’t stick to the grill), be sure your grill grates are very clean and the grill is preheated for at least 15 minutes. Avocado adds creaminess and a punch of gut-healthy prebiotics. Take advantage of the summer sun and cook dinner on the grill. While the grill is obviously the cooking method for casual, outdoor-centered meals and gatherings, don’t forget that you can still bring a touch of sit-down-dinner-type sophistication to the patio table too. This buttery, smoky, and gloriously glaze-y salmon does just that. We call for individual fillets in this recipe, but you could also opt for going with a whole side of salmon (of roughly equivalent weight) for a truly impressive presentation. For a hearty, summer salad that’s bursting with fresh, seasonal finds from your local farmers’ market, this healthy dish is about to be your go-to dinner. Topped with an simple grilled fillet of salmon and tossed in a light, citrus vinaigrette, this salad allows the fresh flavors of the produce to shine through. Substitute or add different produce items based on what’s in season and what you like. If you don’t have a grill, a grill pan can be easily substituted. If you can't find whole trout, use fillets; they'll only need to grill for about 4 minutes. You can also use 20 ounces frozen, thawed cherries: Use the liquid (don't drain them); simmer in step 1 until the liquid almost fully evaporates before stirring in the port and honey.